For Employer's news go to the Employer's Section below. Currently we are not advertising vacancies here. To work at Cyrenians Community Centre, High Street, Swansea. For more information please download the job description and person specification documents. (MS word). To apply for the job above please download our Application Forms below (currently only available in Adobe pdf format). 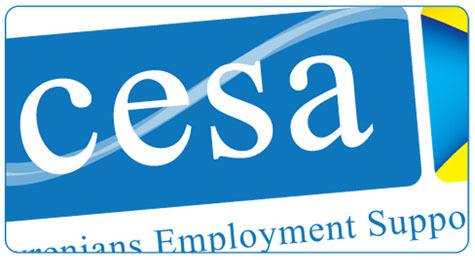 To work at CESA - Cyrenians Employment Support Agency, St Mary's Square, Swansea. This is a temporary position until December 31st 2014. For more information please download the job description (MS Word 38kb). For more information please download the job description and Personal Specification documents (MS Word) . or via our online contact form. Due to the unique way in which Cyrenians Employment and Training Ltd are funded we are able provide you with a FREE service to advertise your vacancies on the same day you give them to us; follow a rigid pre-selection criteria so you only see people who are right for the job; give you an update within 24 hours and every day after that; offer you our office space to conduct interviews and prepare our clients to make sure they understand your business needs. A single named point of contact will be available whenever you need them to offer in work support assistance and seek tailored training packages that are specific to your business. We can also offer advice on progressing your existing workforce and accessing free training provision. Cyrenians Employment Support Agency work with a wide range of clients from varying backgrounds and sectors. Register your vacancy with us and we will work with you to ensure you find the perfect fit for your organisation. If you wish to contact us directly from this web site then please complete the form below. Cyrenians Employment Support Agency provides a professional, free of charge recruitment solutions for local businesses as well as a dedicated individually tailored package of practical support and advice to job seekers across the Swansea Bay area. This includes computers and free access to the internet for job searchers, help with CV writing and application forms, careers information and advice on training and interview preparation. For contact details please go to our contacts page.